Sometimes we need to test disks connected to camera and find out if a particular model is a good candidate for in-camera stream recording application. Such disks should not only be fast enough in terms of write speed, but they should have short ‘response time’ to write commands. This ‘response time’ is basically the time between command sent to disk and a response from disk that this command has finished. The time between the two events is related to total write speed, but it can vary due to processes going on in internal disk controller. The fluctuations in disk response time can be an important parameter for high bandwidth streaming applications in embedded systems as this value allows to estimate the data buffer size needed during recording, but this may be not very critical parameter for typical PC applications as modern computers are equipped with large amount of RAM. We have not found any suitable parameter in disk specifications we had which would give us a hint for the buffer size estimation and developed a small test program for this purpose. This program basically resembles camogm (in-camera recording program) in its operation and allows us to write repeating blocks of data containing counter value and then check the consistency of the data written. This program works directly with disk driver and collects some statistics during its operation. Disk driver, among other things, measures the time between two events: when write command is issued and when command completion interrupt from controller is received. This time can be used to measure disk write speed as the amount of data sent to disk with each command is also known. In general, this time slightly floats around its average value given that the amount of data written with each command is almost the same. But long run tests have shown that sometimes the interrupt return time after write command can be much longer then the average time. The delayed interrupt times of these disks are considerably different although the difference in average interrupt times which reflect disk write speeds is not that big. It is interesting to notice that the amount of data written to disk between two consecutive interrupt delays is almost twice the total disk size. 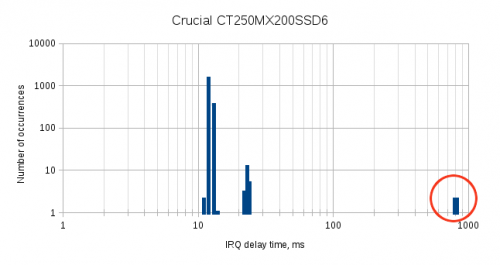 smartctl reported the increase of Runtime_Bad_Block attribute for CT250MX200SSD6 after each delay but the delays occurred each time on different LBAs. 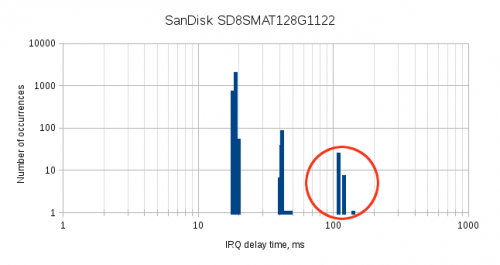 Unfortunately, SD8SMAT128G1122 does not have such parameter in its smartctl attributes and it is difficult to compare the two disks by this parameter.